It was a bullish week for US equity indexes, with net weekly gains ranging from +2.8% (Nasdaq comp'), +2.4% (R2K), +2.2% (Trans'), +2.0% (sp'500), +1.6% (Dow), to +1.6% (NYSE comp'). Near term outlook offers a little weakness, but holding above recent lows. 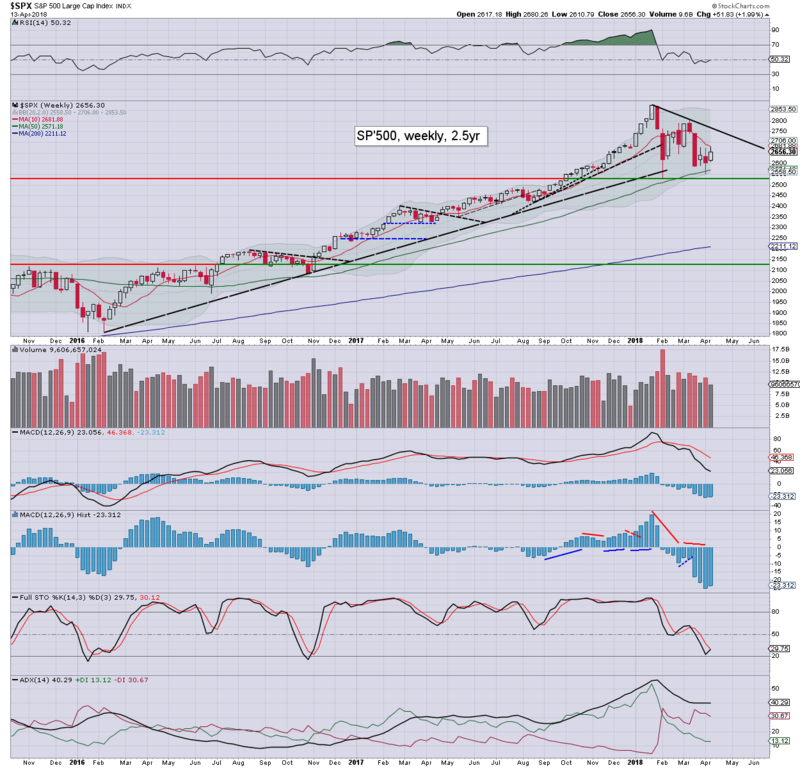 The sp' saw a net weekly gain of 51pts (2.0%), settling at 2656. 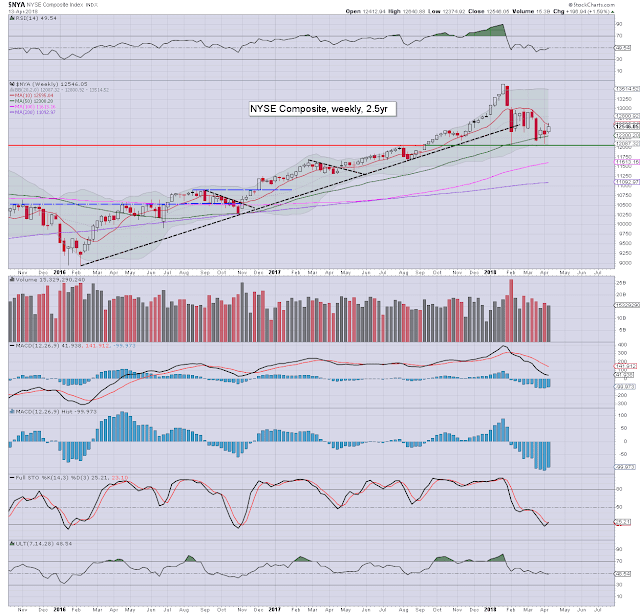 Note this Friday's opening high of 2680, just 1pt shy of the key 10MA, which is first resistance. Underlying MACD (blue bar histogram) cycle ticked higher. At the current rate though, we won't see a bullish cross until at least mid May. I remain somewhat concerned that the 'legacy gap' - from Sept'11th 2017, of 2474/61 is yet to be filled. No alarm bells unless a daily close under the 200dma, if not last week's low of 2553. 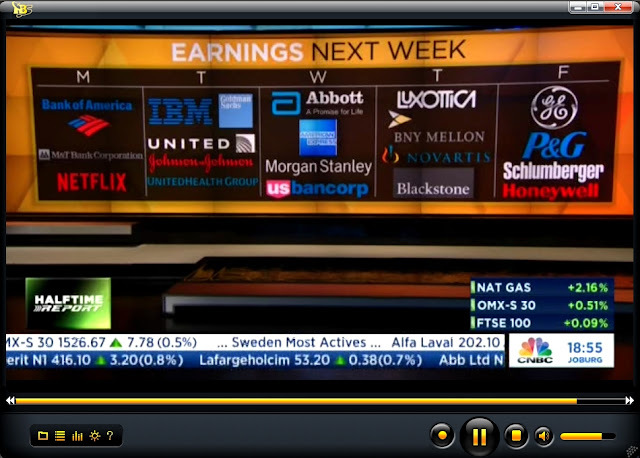 The tech sector is leading the way back upward, with the Nasdaq comp' +2.8% at 7106. Note the 10MA, holding as first resistance. 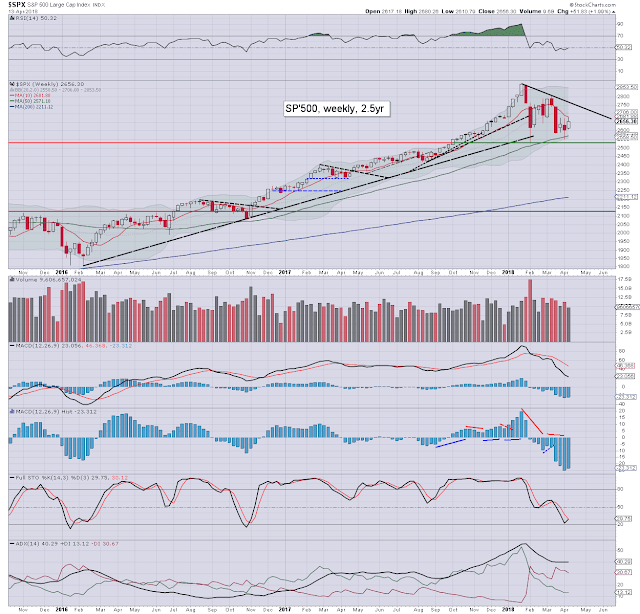 Cyclically, tech looks floored, after seeing a higher low (6805) last week, relative to the Feb' low (6630). The mighty Dow gained 1.8% to settle at 24360. Note declining trend/resistance from the Jan' high, that also syncs with the 50dma. 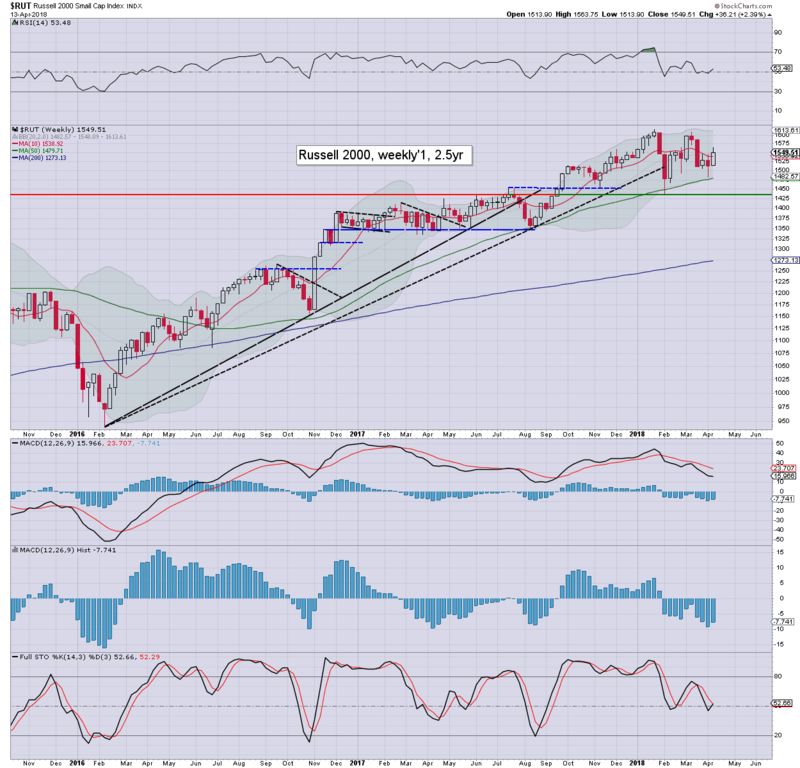 A push and hold >24646 would be bullish into the early summer. Things would turn exceptionally bearish if <23344. Cyclically, very low. The master index gained 1.6% to 12546. 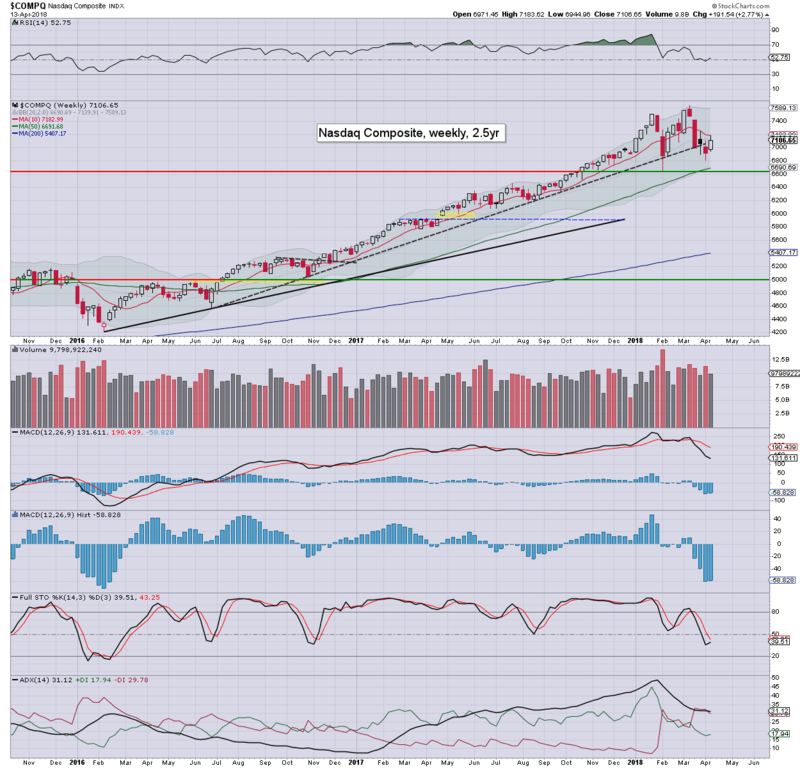 Like other indexes, note how the 10MA is holding as first resistance. 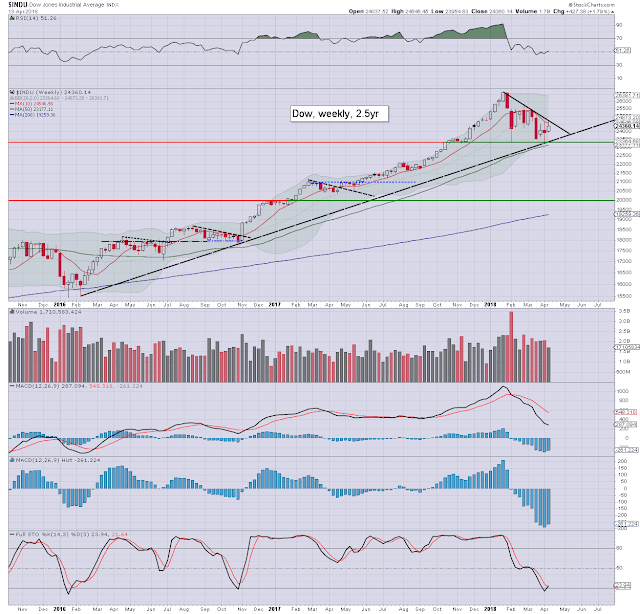 The second market leader gained a very significant 2.4% to 1549, notably back above the key 10MA. 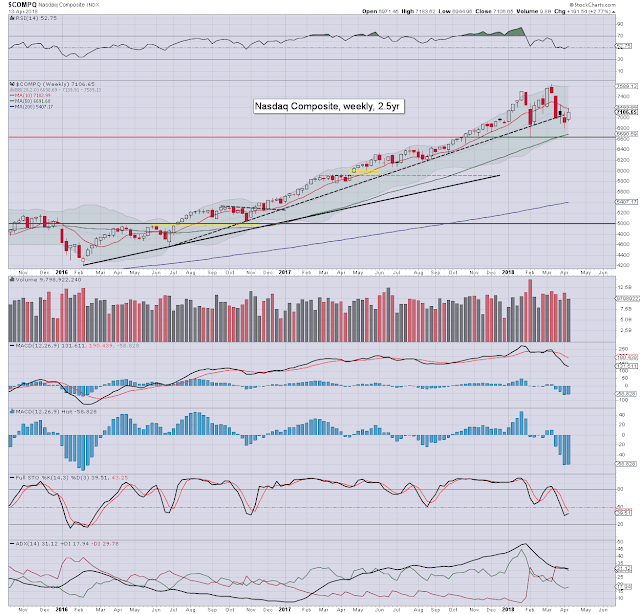 The 'old leader' settled +2.2% at 10369, notably under the key 10MA. Broadly choppy. 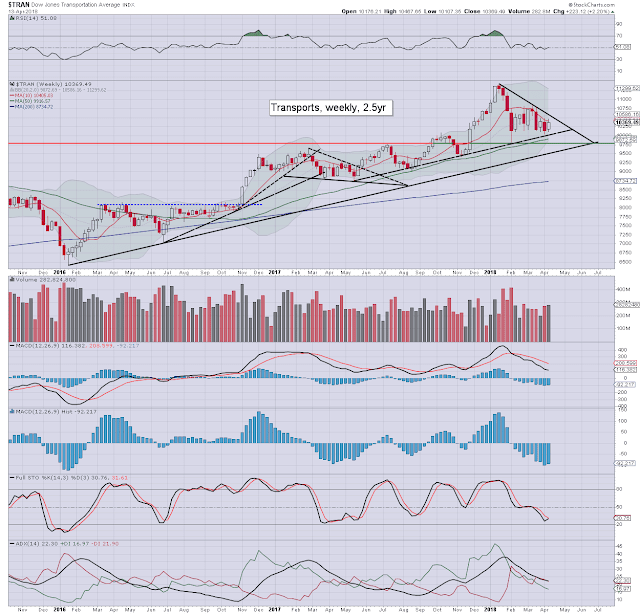 Bullish >10600, bearish <10000. 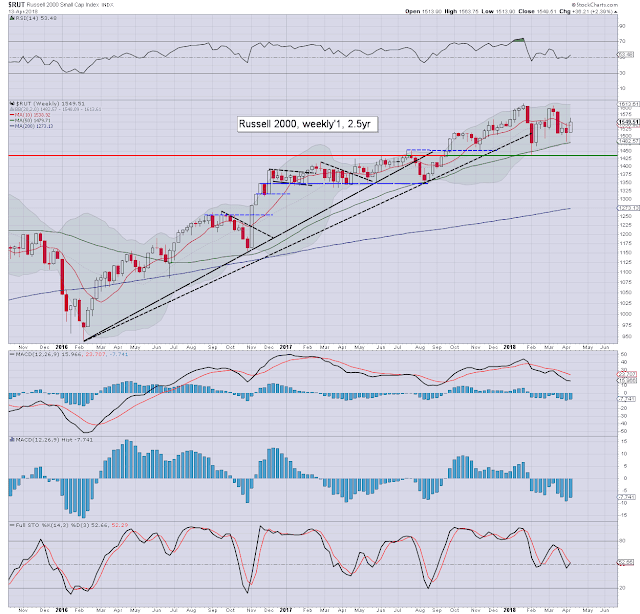 The Friday black-fail daily candle bodes bearish for next Monday. 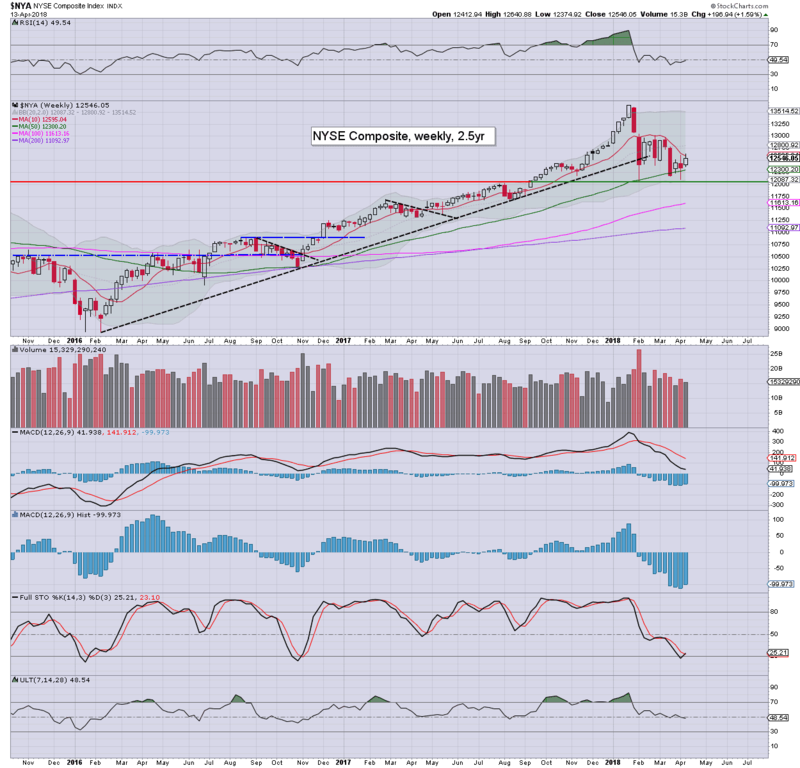 All six of the main equity indexes saw sig' net weekly gains. The Nasdaq remains the strongest index, whilst the Transports is broadly the laggard. Most indexes have a marginally higher low - relative to early Feb'. Only the Dow has broken under the Feb' low. Key earnings: BAC, NFLX, IBM, MS, BX, GE, and SLB. -Syria: having now been attacked by a mini coalition of the US, UK, and France. With that uncertainty out of the way, the market should rally, after any opening Monday weakness. -Sporadic presidential tweets, which are unquestionably directly swinging the market around, especially within pre-market. For the short term traders, this is starting to get annoying. -North Korea. A meeting between the US and North Korean leaderships remains due within the near term. If some initial agreement can be made, then it would be a major positive for all world markets, at least to some degree.